Bruce Vincent, shown with son Brian, wife, Cindy, and daughter, Danielle, can no longer run the family’s grocery store. Third in a series of occasional articles about the Vincent family’s struggle with Alzheimer’s disease. WESTMINSTER — Brian Vincent hadn’t gone on a vacation in a year. Since taking over management of the family’s grocery store, even a sick day was rare. But one morning last month, a feverish Vincent silenced his cellphone and crawled under the covers for a few hours. He woke up to a flood of text messages and four missed calls from his mother, who was minding the store. His dad, Bruce, diagnosed with Alzheimer’s disease three years ago, had been wandering the aisles and she was trying to keep him occupied with chores. There were questions about shipments, and she was neglecting her gift shop next door. “I cannot be sick, or relax and take a day off without things falling to pieces,’’ Brian Vincent would later say. 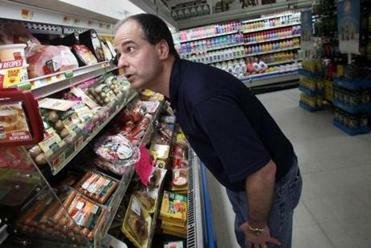 Six days a week, Brian, 26, and his mother, Cindy Vincent, juggle their store managing duties while also scrounging for activities to keep Bruce busy and feeling useful at the store he opened two decades ago. He is just 48, but his wife and son are hesitant to leave him alone at home for too long because of his increasing forgetfulness. They are approaching and dreading the day when they will have to find a program for him during work hours. At 48, with a face still wrinkle-free, Bruce Vincent is starting to forget things he has long known — how to stock shelves, how to make change at the cash register, how to read a digital clock. The form of Alzheimer’s that Bruce Vincent has, striking before age 65, is rare, affecting only about 4 percent of the estimated 5.4 million Americans with the disease. 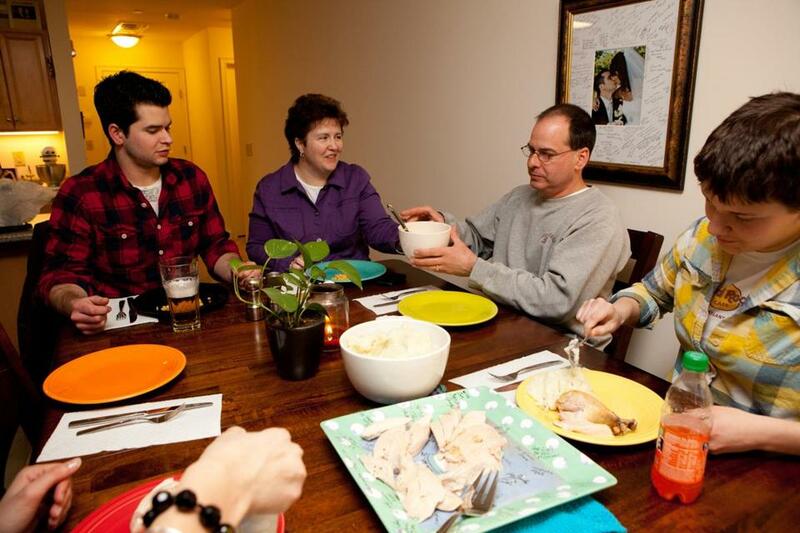 His family’s anxiety, uncertainty, and exhaustion are universal, though, shared by the families of many Alzheimer’s patients, said Paul Raia, vice president of clinical services at the Alzheimer’s Association of Massachusetts and New Hampshire. In Massachusetts and nationwide, the need for services, especially daytime activity programs for patients like Vincent who are still relatively healthy, is expected to grow sharply as baby boomers age and the number of Americans with Alzheimer’s is projected to more than double by 2050. There has been a steadily rising demand for the association’s support groups and educational sessions, and the Vincents have turned to them for help. On a recent Monday evening, Brian Vincent took a seat among a small circle of chairs in a drab, second-floor room of a Somerville municipal building and listened intently as a woman a couple of seats away talked about her 58-year-old father. Her dad, she told the group, was a vice president of a technology company a few years ago, but now he has trouble remembering to eat and sometimes spends hours at home staring at the wall while his wife, his high school sweetheart, is at work. A year from now, she said, she fears he will have reached the final stage of the disease, when most patients are unable to communicate, feed themselves, or even smile. Vincent slumped in his chair and looked at the floor. Many portions of the woman’s experience mirror his own, only his father is 10 years younger than her dad, and Alzheimer’s has not yet robbed him of as many abilities. Bruce Vincent once jokingly told his wife, Cindy, that if she went into labor with their first child on a Monday evening, Vincent’s longstanding volleyball night, she would have to delay the delivery. That was 27 years ago, and their first child, Jeff, inherited his father’s passion for the game. It’s been their weekly guys-night-out for the past decade, father and son meeting up for a two-hour, fast-paced league match in the gymnasium of the Immanuel Lutheran Church in Holden. While the game is about 30 minutes away from Bruce Vincent’s home in the Central Massachusetts town of Westminster, Jeff and the family hold tightly to this cherished ritual — now a crucial anchor in their disrupted lives. During a recent game, Bruce Vincent stepped to the line to serve and looked to his son nearby. “Eleven, seven’’ Jeff whispered, giving him the score. “Eleven, seven, ’’ Bruce announced, then served. The routine was repeated, again and again, as the Vincents’ team scored five straight points. In the past year, as Bruce Vincent’s decline hastened and his confusion grew more noticeable, his son confided in several teammates about his father’s diagnosis. Last August, Bruce Vincent reluctantly stopped driving after he failed a skills test. Since then, family members have taken turns as designated drivers to ensure some stability as the abnormal becomes normal. Monday night volleyball for father and son has morphed into a gathering of the entire family for a pregame dinner. Jeff then drives his father to the match and later meets his bleary-eyed, pajama-clad mother in a gas station parking lot halfway between their two towns, to complete his father’s ride home. “Since dad’s diagnosis, my mom has been in overdrive, trying to plan family stuff,’’ said Brian Vincent, who like his brother and their younger sister, Danielle, 21, stands a 50-50 chance that he inherited a gene from his father that causes the rare early onset form of Alzheimer’s. Among the more unusual events she organized was a January family outing to a vertical wind tunnel in New Hampshire where Bruce and his children were able to float in the air above a trampoline. The burden of caring for their father has fallen most heavily on Brian. A year ago he bought a Suzuki 1,000 motorcycle from his brother. He loved testing its power on warm days after work, sometimes pushing it to 80 miles per hour in first gear. But he recently sold the bike because he worried what would happen to the store his father started if he were in an accident. Up at 5:15 for work, Brian rarely goes out with friends anymore because he is getting ready for bed when most are heading out for the evening. His mother has been trying to convince him to hire more help to ease the load. She also is increasingly bringing her husband on errands with her during the day, to give Brian a break. Finally, after much cajoling, she convinced her son to take a week off. He went with a friend earlier this month to a trade association convention in the Dominican Republic. While he was away, a refrigeration system in the store failed, something Bruce used to know how to fix and had trained Brian to repair, too. During the past year, Brian and Jeff Vincent have attended monthly support group meetings in Somerville, where members glean advice from each other and sometimes vent about their shared experiences as the children of parents who have been diagnosed with Alzheimer’s before the age of 60. The gatherings help ease some of the isolation, said Sarah Coletti Morse, a 31-year-old marketing manager. Morse has been searching for activities for her father, the 58-year-old former technology executive, who is still physically active even as his mind is failing. Her parents recently checked out a program that sounded promising at a local senior center, but the class turned out to be a group of 80-year-old women line-dancing with walkers. Morse later listened as Brian Vincent spoke of his exhaustion at managing his family’s store six days a week, while finding chores that his father can still do and then having to discreetly fix his mistakes afterward. The dearth of safe and stimulating programs for Alzheimer’s patients who are no longer able to work or drive, but who are still vibrant, is a significant problem, said Raia, of the Alzheimer’s Association. And many of the affordable programs that do exist are facing cutbacks. Governor Deval Patrick’s proposed budget for the year starting July 1 includes $55 million in cuts to adult day health services, a community-based program that provides activities for more than 7,000 disabled people and very frail elders, many with Alzheimer’s. An estimated 5,600 people would lose the services as a result. “Being active, having a sense of purpose, being social, getting good exercise, all of these things contribute to helping the disease move more slowly, but folks in the early stages of the disease are not getting that treatment because of a lack of resources,’’ Raia said. Nationally, the Alzheimer’s Association is piloting “social engagement programs,’’ helping to train staff at selected nonprofits, such as food banks, so they know how to work with volunteers who have Alzheimer’s, said Beth Kallmyer, the organization’s senior director of constituent services. In the void, families are shouldering the burden, she said. The association estimates that in 2010 alone, nearly 15 million Americans provided 17 billion hours of unpaid care to family members and friends with Alzheimer’s. Cindy Vincent knows that she and her children have been shielded from figuring out the next step longer than most. But she knows that can’t last, and worries how she will be able to cope with her husband at home. Unable to make change at the cash register, order stock, or manage the books, Bruce Vincent, who loves to work, spent many hours mopping the store’s floors this winter and shoveling snow. “I’ll clean the basement,’’ he said. His wife gently tried again. “I am just setting up a scenario,’’ she began. “I don’t see myself getting to that point,’’ he replied.